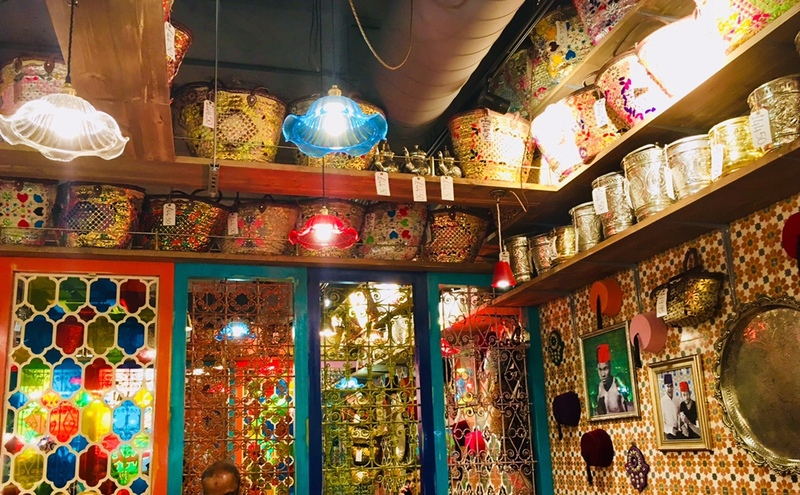 I heard rumblings of the Comptoir Libanais at Grand Central opening back in January; last month it finally opened its doors. 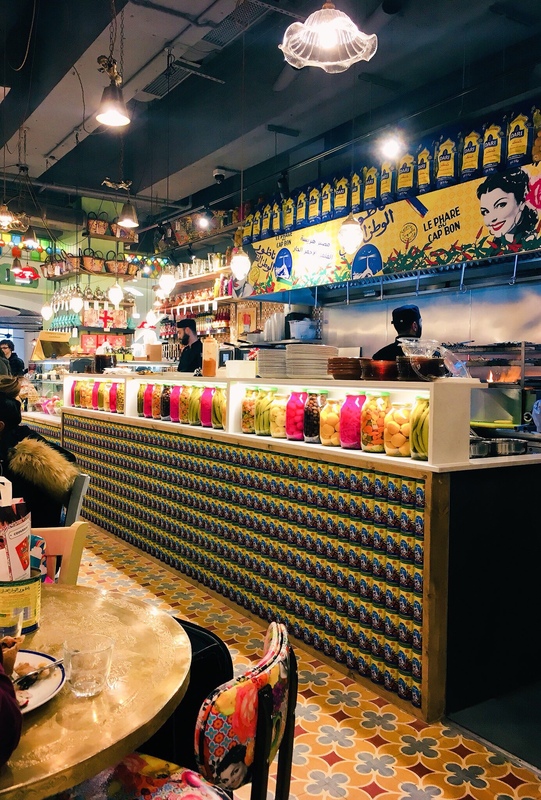 Offering Middle Eastern style food, Comptoir Libanais at Grand Central specialises in Lebanese dishes, and has a small number of venues scattered across the country. Having a long-term love affair with pretty much everything Damascena puts on a plate, I was interested to try out the new competition. Tastefully bright and colourful, there’s plenty of nods to the warmer climes that inspire the food. The smaller details such as fez hats and the beautiful tiles are delightful, and it’s a decent size cafe considering the location. Despite also doubling up a a shop, it manages to make you forget you’re essentially in the attic of a train station, and for that we should all be grateful. 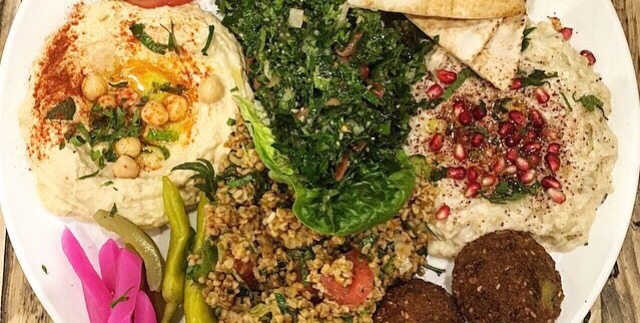 Being that Middle Eastern dips are like catnip to me, the Mezze Platter for two (£16.95) was a given. 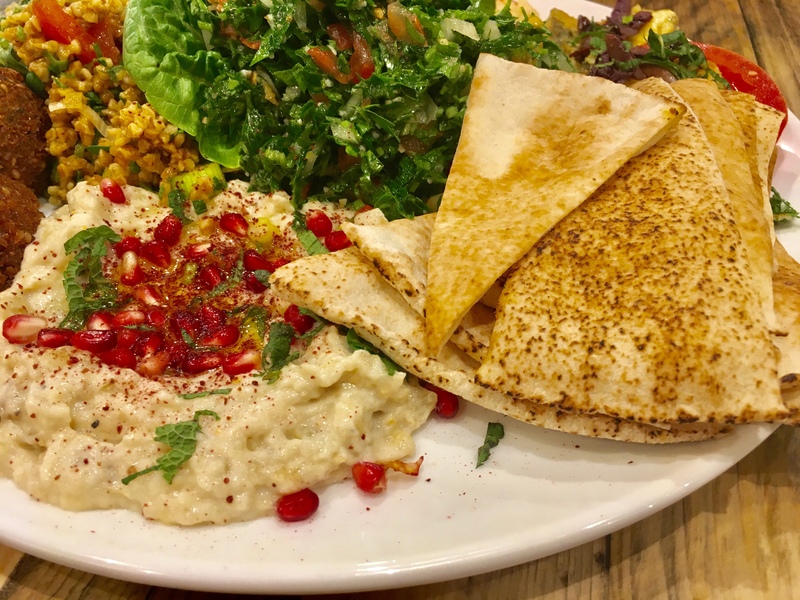 A silky baba ghanuj made a good first impression and the hummus was richly flavoured with tahini, but didn’t quite match up to the same offered at Damascena. 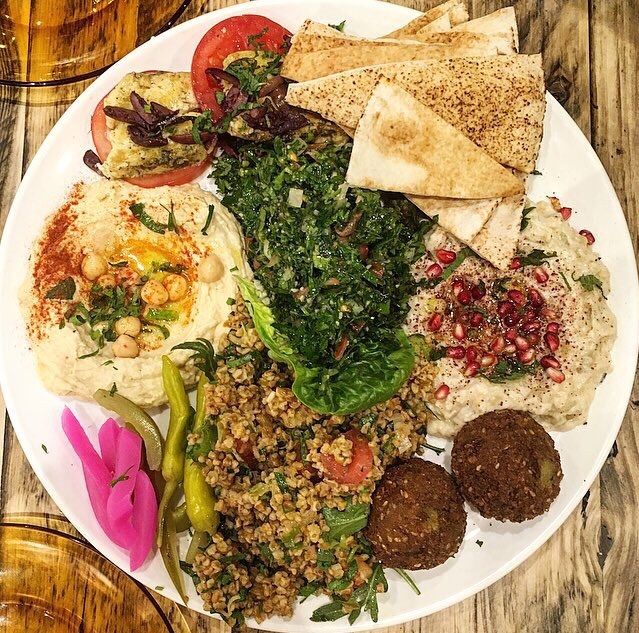 It was always going to be a hard task; that hummus is the best in Brum. 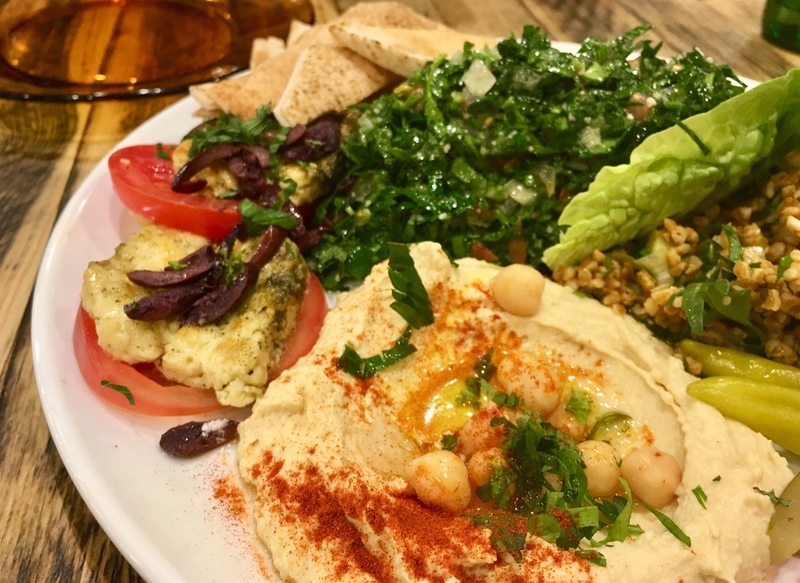 A well seasoned tabbouleh hit the spot with punches of lemon and fresh mint, whilst crisp falafel begged to be dunked in the creamy dips, along with the toasted pitta pieces. 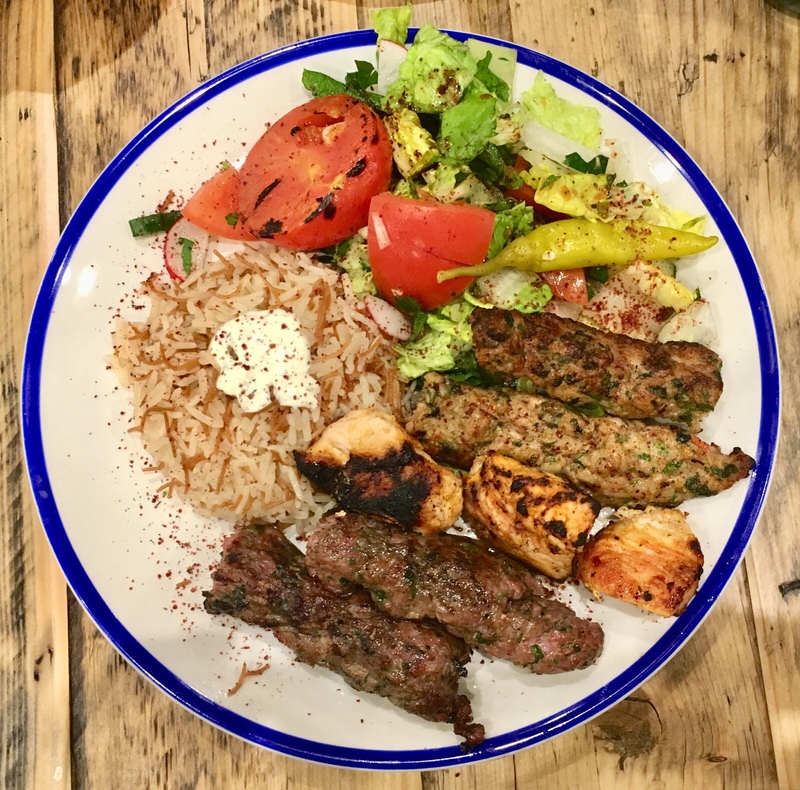 A grain-fuelled freekeh salad wasn’t as interesting as the rest of the platter, but eaten alongside the grilled halloumi (which my husband snaffled like a cheese ninja) and pickles was perfectly pleasant. 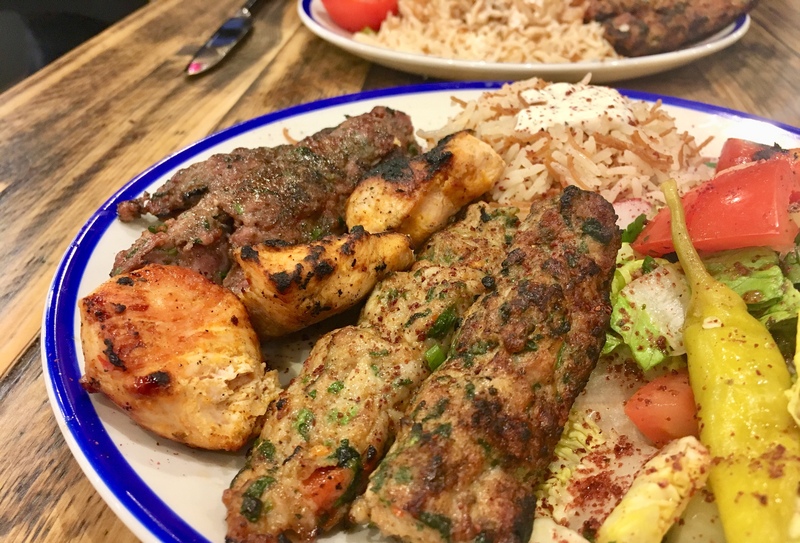 Next up a Mixed Grill (£13.95) hit the table, and provided three skewers of meat served with vermicelli rice. Charred gently on the outside, the moist chicken kofta did more for me than the lamb version which didn’t have quite the same charm and came with several little nuggets of gristle. My husband didn’t have the same issue so maybe just bad luck on my part. Chicken shish taouk was tender and gently flavoured with cardamon, garlic and cinnamon, moist thanks to the zingy yoghurt marinade I’m told it’s been bathed in prior to seeing heat. The side salad was a little overdressed with lemon juice to my taste and I wasn’t that enthusiastic about the rice. 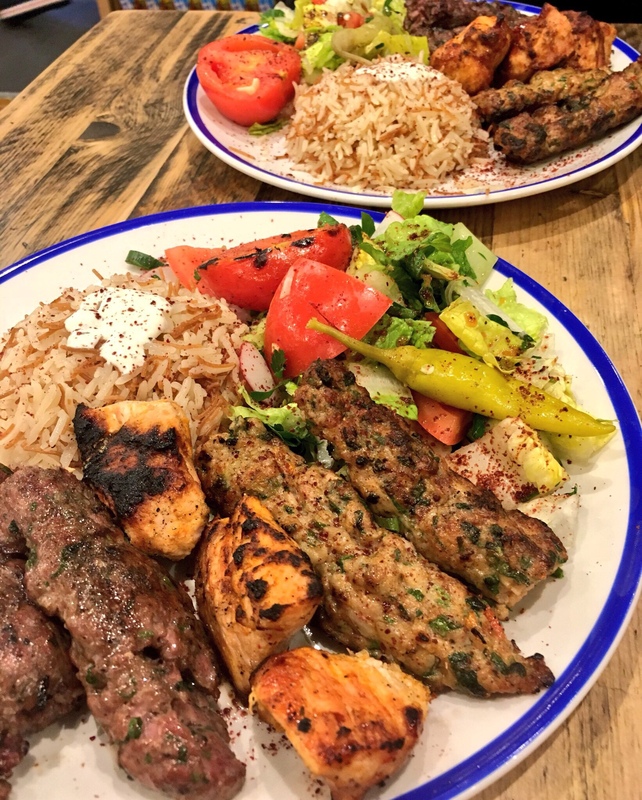 Still, it’s undeniably a lot of food for one person (especially after the previous mezze massacre) and you can’t knock the price tag. We declined dessert which a few hours later I regretted; I’ve since gone back and stocked up on baklava. I tried two cocktails; the first was truly delicious, the second all faff and no flavour. 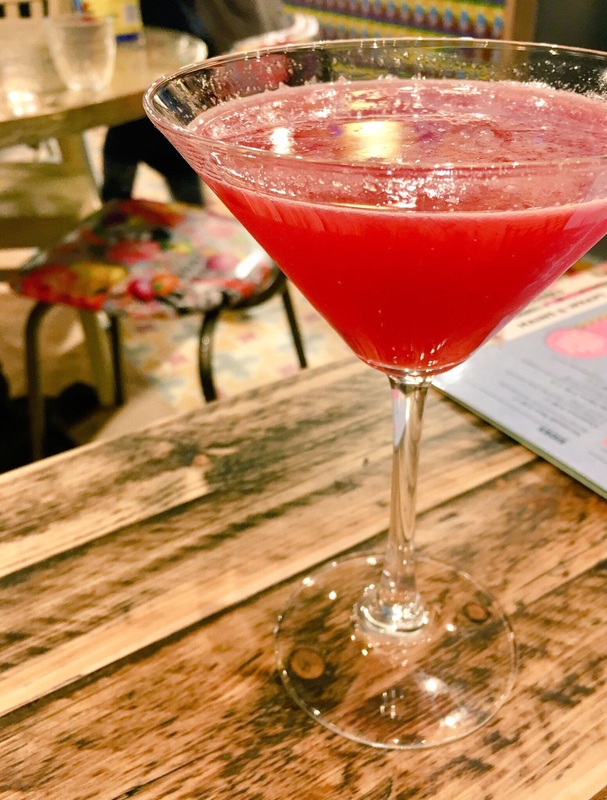 The Roomana Vodka Sour (£7.95) came served like a Cosmo, flavoured with pomegranate juice, fresh lemon and floral rose syrup. It’s liquid Turkish Delight and I’m more than onboard. 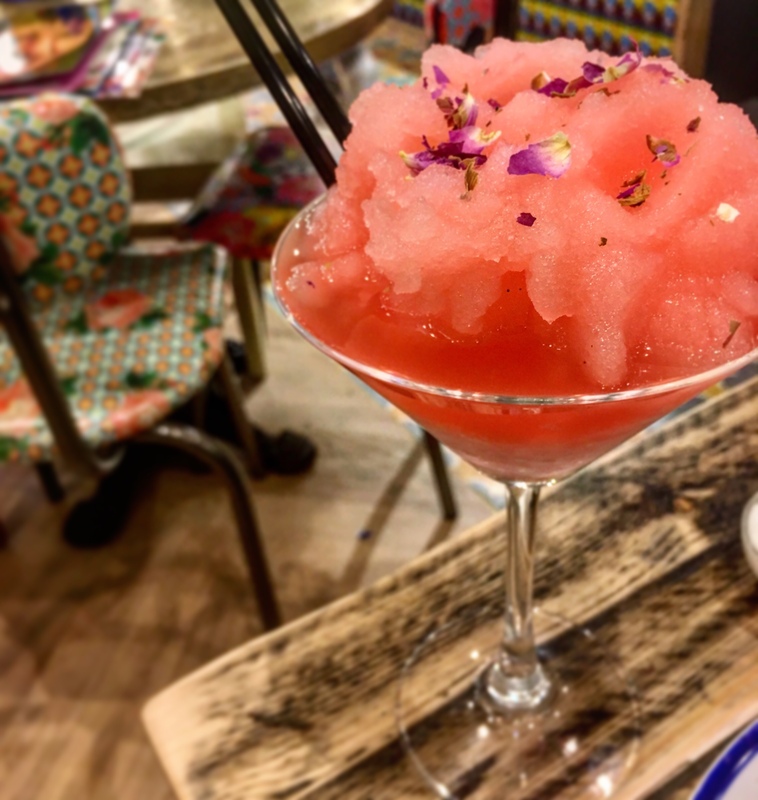 The frozen Rose and Rum Daiquiri (£7.95) is pretty but not worth the energy it takes to melt/drink it. I realised right at the end this place also does breakfast, and I came back a few days later to try the Sirine’s Breakfast (£7.95) of halloumi, fool moudamas, zaatar roasted mushrooms, sumac fried egg, Lebanese potatoes and flat bread. (In fact, I’m enjoying it right now as I write this). The same bubbly waitress remembered me and the table service was, again, top notch. If you can bag a table away from the main bar/walk way you’ll find it less hectic during busy times. It’s not perfect but there’s some good, honest grub happening here and it’s been packed out ever since it opened its brightly coloured doors. Come hungry, bring friends, and forget entirely you’re sat in a train station. If you like the sound of this place you may also like Damascena, Cappadocia, or Syriana. 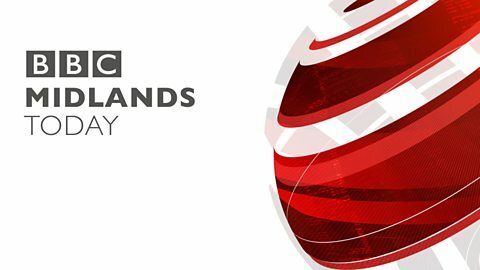 Are you excited about this new addition to the Brum food scene? Let me know in the comments. Disclosure: I was invited for my first meal but I’ve paid for food and drink thereafter. Photos and words are mine, as are all opinions about the food. I was not asked to write about my experience.